Prepare Avocado Oil Vinaigrette up to 24 hours before serving; refrigerate. Halve squash lengthwise; scoop out seeds. Place halves cut-side down in a large saucepan; add water to a depth of 2 inches. Cover and bring to a boil. Reduce heat; simmer squash 20 minutes. Drain and cool squash. 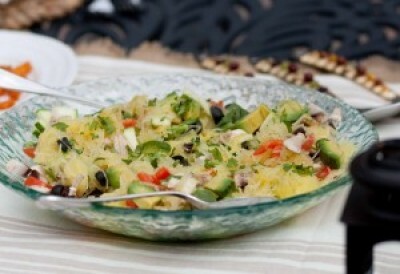 With a fork, pull off spaghetti-like stands of the squash and place in a large salad bowl.